Frédéric-Charles Bargone (1876-1957) wrote numerous books (between 1902 and 1955), some of which were fantastic or science-fictional, under the pen-name Claude Farrère. Fumée d’opium (1904; translated by Samuel Putnam as Black Opium, 1929) is a collection of fantasy stories; and some stories in the untranslated Contes d’outre et d’autres mondes (1923) are science fiction. La maison des hommes vivants (1911; translated by Arthur Livingston as The House of the Secret, 1923) is about experiments in longevity; while Les condamnés à mort (1920; translated by Elisabeth Abbott as Useless Hands, 1926) is about workers striking against the threat of automation: they are disintegrated by a new weapon and machines take over their jobs. These summaries are from the Encyclopedia of Science Fiction. Farrère, as I shall call him, was born in Lyons. His father was a colonel of marines, serving in the French colonies; his mother was English. In 1894 Farrère enrolled in the École navale, and got his first commission in 1899; he was promoted to lieutenant in 1906, and “capitaine de corvette” en 1918. He left the navy in 1919 to devote himself to writing. Between 1899 and 1914 he was involved in campaigns in China and Morocco. As yet I know very little of his War Experiences between 1914 and 1918. His writing career began only three years after his naval career. Initially he used the pseudonym Pierre Toulven, for a series of articles on naval and colonial matters. In 1902 he came third in a writing contest organised by Le Journal, and one of the judges, Pierre Louys, offered to help him in his career. At the advice of Louys he adopted the pseudonym Claude Farrère; the last name was based on an anagram of the Italian town where his ancestors apparently came from: Ferrara (Ferrare in French). The writer Pierre Loti, who was also Farrère’s superior in the Navy, congratulated him on his collection of stories, Fumée d’opium, in 1904. In 1906 he won a Prix Goncourt for his novel Les Civilisés. He wrote on a wide range of subjects through his career: not just novels, but travel books, and books on current affairs. He was particularly interested in some of the more exotic parts of the world. He visited Turkey on eleven occasions, but was particularly interested in Japan. According to Wikipedia, “the perfume Mitsouko by the long-lived perfumer Guerlain” is named after a character in his 1909 novel La Bataille, which is about the love affair between an English officer and a Japanese woman. In 1906 he anticipated Agatha Christie by twenty years when he published L’Homme qui assassina, where the murderer was the narrator of the detective novel. After 1930 he was President of the Association des écrivains combatants (Association of Veteran Writers). 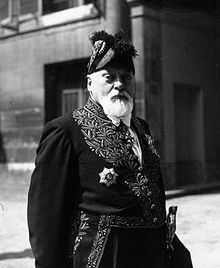 In this capacity, on 6 May 1932, he was talking to President Doumer, at the opening of a book fair in Paris, and tried to protect the President when Doumer was fired on by a mentally disturbed Russian; the President was killed, and Farrère received two bullets in his arm. In 1933 he agitated for the protection of persecuted Jewish intellectuals, and for their welcome into France. He was elected to the French Academy in 1935, replacing Louis Barthou, who had been assassinated a few months previously; he was received into the Academy on 23 April 1936 by his friend Pierre Benoit. My information comes largely from the article by L. Martal in the Dictionnaire de Biographie Française, fascicule 75 (1972), supplemented by Wikipedia and Wikipédia.